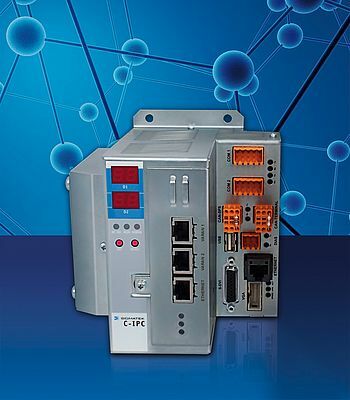 Sigmatek's Compact-IPC C-IPC is now also available with an Intel-Atom processor. It combines high computing power with low current consumption and can be used for control, visualization and motion. For complex applications, the IPC can be used as a one-CPU solution. In decentralized concepts, it can be networked with additional CPUs, control panels or operating devices. Two Compact Flash cards (from 128 MB to 8 GB) serve as program or data memory. The robust technology and the elimination of rotating parts make the IPC fit also for demanding industrial applications. The power package measures 133 x 116 x 125 mm (WxHxD) and therefore fits into the smallest control cabinets. The IPC has several standard interfaces: 2 Ethernet, 2 VARAN, 2 CAN, RS232/ RS485/ RS422, USB, S-DVI and VGA. With various expansion cards, the user can extend the C-IPC with additional interfaces such as VARAN, Ethernet, LPT or RS232/RS485/TTY/Multidrop bus to suit his application.